This 8 oz. 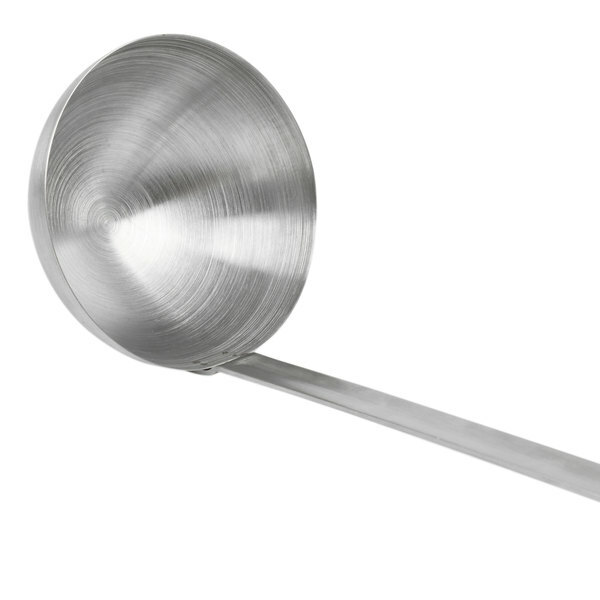 soup ladle is crafted with durable stainless steel that's strong enough to withstand repeated use in any commercial kitchen. An integrated hooked handle allows for the item to easily sit on the edge of pots, while this item is very easy to clean at the end of a shift. 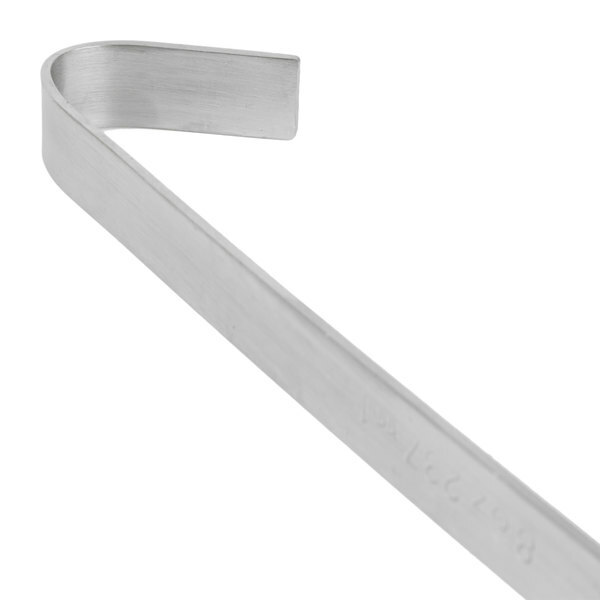 This ladle is the ideal complement to any chef's traditional set of utensils. Beware! This is way bigger than you picture it in your mind, not that it's a bad thing, but just be prepared for a big sized ladle. If you're like me and live alone then a ladle this size really is too big (even though I still use it) and I think I'll order a smaller one soon just to make things easier for myself, but if you live in a larger family I suggest getting this big ol' boy! Nice 8oz ladle, perfect for portioning out your servings. It has more of a matte finish, so maybe not nice enough for serving guests, but great in the kitchen. We purchased several sizes of these, they have worked great for us. The handle is attached well and seems to be constructed well. 2 years later they are still holding up great. Great two piece ladle , well made and easy to clean , and the price is really good , the shipping is fast and the customer service is great . Great ladle. I especially like that it is labeled with the 8 oz on the handle. Will need to get more of these in other sizes. 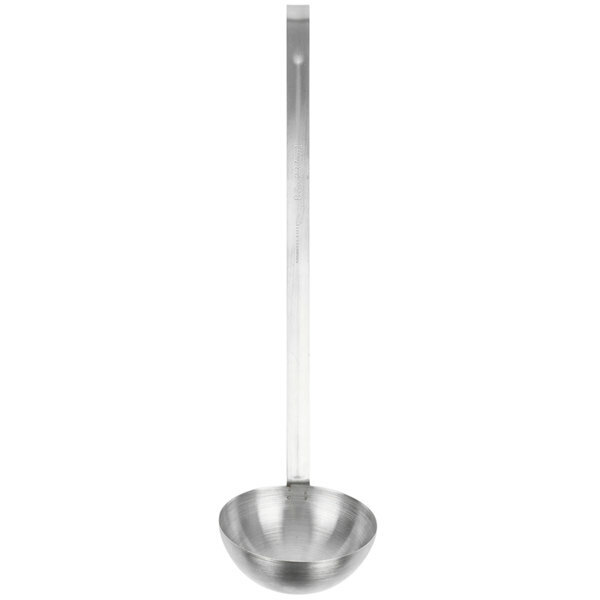 This 8 ounce serving ladle allows you to serve a very generous portion with one simple scoop. This ladle is made of stainless steel and has a very nice appearance to it so we like to use this for front of house when needed. The hook on the top make both storage and service very convenient. This 8oz 2 price ladle is great. It gives you perfect portions every time and the l9ng handle is great for extra large pots. The hook on the end makes it easy to store or keeps it in place on the pot. The 8 oz. 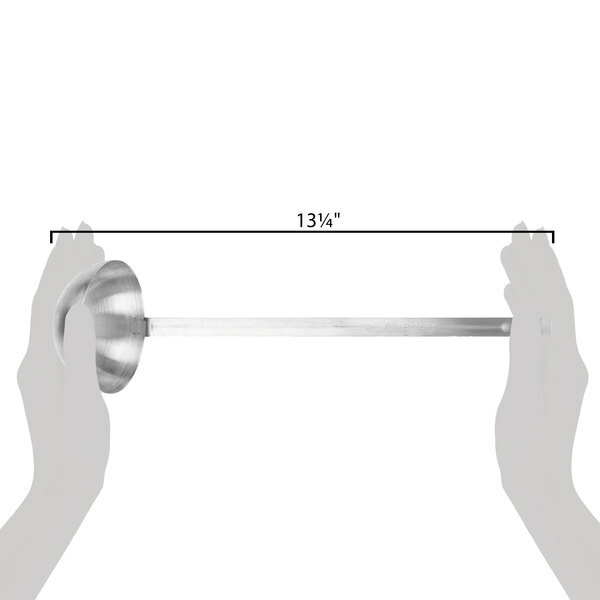 Two-Piece Ladle is a good quality ladle at a great price! It has a long handle that can easily reach the bottom on large pots and it is very sturdy and durable. I would highly recommend this for catering events or for commercial kitchens. This eight ounce two piece stainless steel serving ladle is a stunning show-off piece for any high-end catering event when serving everything from punch to seafood stew. Very durable and would recommend. And a special thanks to customer service for the sincere recommendations. 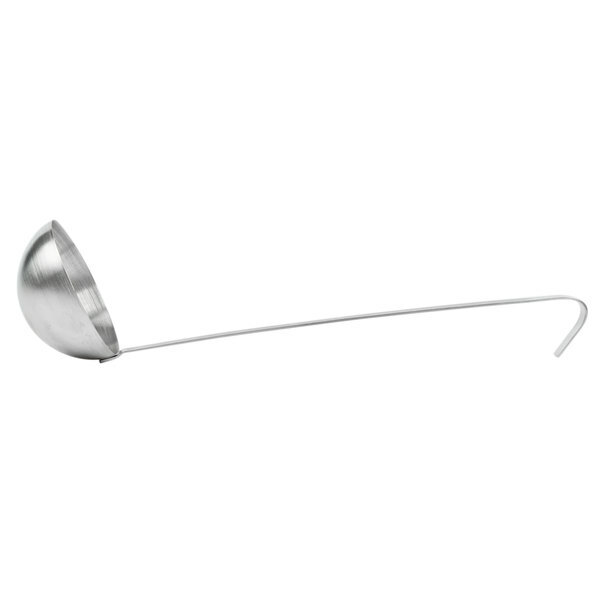 We were concerned with this ladle being able to hold together due to the inexpensive price. This ladle has held up quite nicely for over a month. Very happy with it. These are nice basic ladles. I love that they are priced very well and they come in all different sizes. I will purchase these again. I would buy this again i don't use it as often as the smaller ones so it should last a while and if it doesn't at least it was cheap. This is a decent 2 piece ladle I bought from webstaurant store. I accidentally purchased a few of the 2 piece ones. I would spring the little extra for the one piece. They seem ok but can't speak for the longevity of them. Used the 8 oz. Two-Piece Ladle to pick up cheerios. Get 8 oz worth of cheerios and eat for breakfast with no worries that you are eating too much. This is the perfect size ladle to fill up a bowl of soup. I love that is it stainless steel and built solid which makes it seem like it should cost more. Webstaurant's customer service is also exceptional because a ladle came damaged and within days I had a new one in hand. Couldn't be any happier with the products and service Webstaurant has. If you need a bigger ladle for soups or stews, the 8 oz. Two-Piece Ladle is worth taking a look at. These ladles are all priced very well. Perfect for my soups and easy to use for portion control. Handle is a good length to reach into a big pot. Sturdy and handles dishwasher well. We use this larger ladle as our soup ladle. It is a large portion and works great for the size bowls we offer. Good quality and it does not get hot on the handle. I bought one not sure of the size I needed and now I am ready to buy more sizes, this ladle is extremely helpful with hot soup. 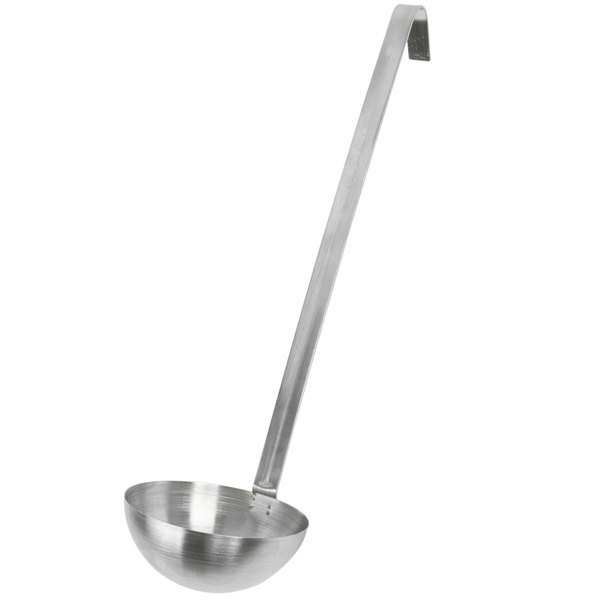 This is a good, value-oriented ladle. Because it's a two-piece there is not a smooth joint between the handle and the bowl part, like on the Vollrath ladles. I'd prefer to spend more money the the higher-quality Vollrath ladles next time. Not bad for what it is, though. Perfect portion size for ladling soups. Long handle makes it easier to control pouring and is very sturdy with great quality. Very good price for the product. Ordered these for use at our annual church spaghetti dinner fund raiser... they measure up 8 oz. serving of sauce perfectly. Perfect for controlling serving size, particularly for to-go orders. Very pleased with their design/size, durability and the price. Very sturdy, handle doesn't heat up too quickly even when ladle is left in a hot pot for extended periods. Does what it should well. 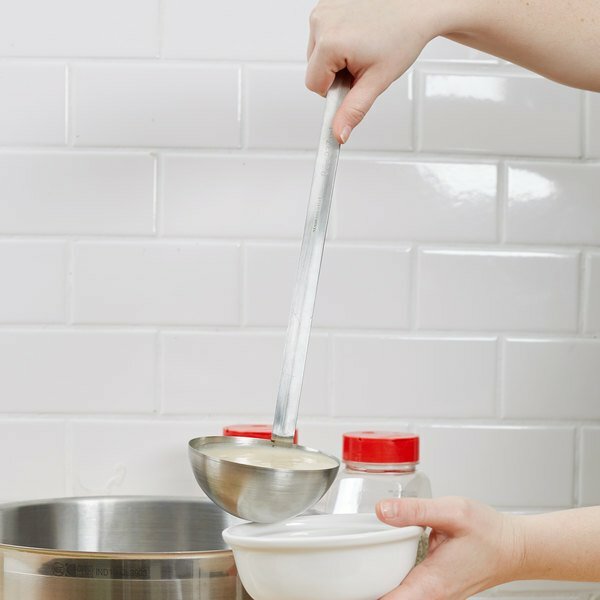 The two piece ladle is a great way to save a bit of money vs the one piece ladle. They are still sturdy and will hold up if not abused. Under moderate use these will fail. A better alternative is a one piece which is a little more expensive. If using for light use these will hold up fine. Thanks for reviewing this item! This is a quality ladle that is offered at a great price. 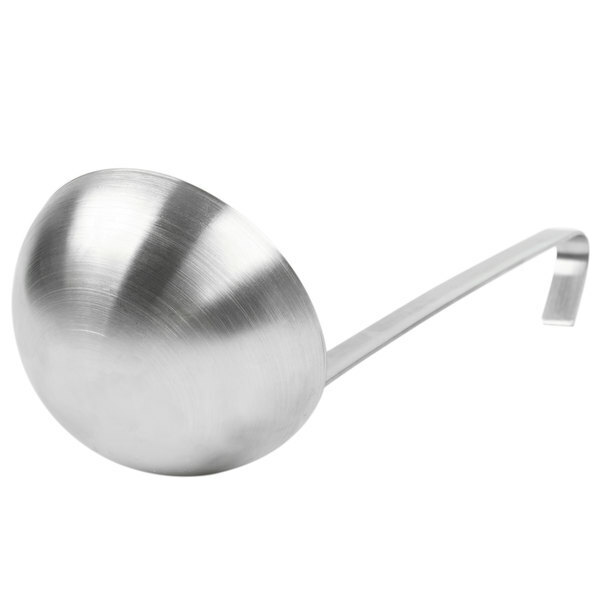 If you are looking for a comparable, one-piece ladle, check out the 8 oz. One-Piece Ladle (item: 92246818). Great craftsmanship and measuring amount on this spoon helps you save on food cost across the board. This is a must have to control the portions you serve and have enough food for everybody. This is a top quality set of ladles. On top of that the price for two of these ladles is cheaper than one from other suppliers.